TSPSC Departmental Tests Results 2018-2019 May/Nov Session : Telangana Departmental Test May 2018 and November 2018 Results available for EOT & GOT Tests at TSPSC. Telangana State Public Service Commission has released the TS Departmental Test results for EOT and GOT. Candidates who have appeared for the exams they can download result, we have to given complete notification wise result and bulletin in table from at the bottom of this page and also view on the official website www.tspsc.gov.in. As per the Public Service Commission Regulations, Telangana State Public Service Commission conducts Departmental Examinations for employees working in various Departments under State Government of Telangana. The Commission conducts Departmental Examinations twice a year i.e., in May and November for the promotions to the employees. The Departmental examinations are held at ten (10) District Headquarters including Hyderabad. The candidates are admitted to the District Centre concerned where the candidates are presently working. Telangana State Public Service Commission has released Departmental Tests Notification for May and November sessions for Telangana employees. Departmental May/Nov Session Tests conducted as per schedule. After completion of tests TSPSC official are going to release departmental test result. 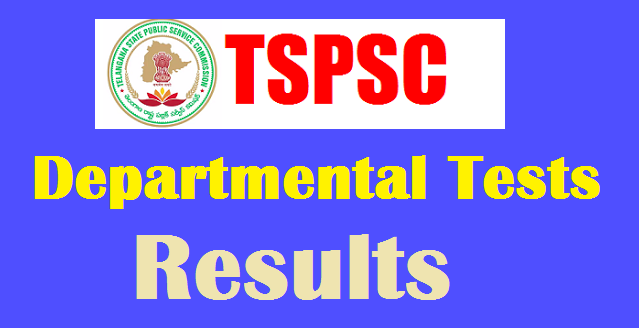 Here in this web page provide TSPSC Departmental Test Results of all notifications for May Session and November session .